Take a horseback ride through the Hoosier National Forest. Christie's husband and fellow guide, Bobby Froehlich, takes a break next to the Rock. Hiking is a big pastime in Southern Indiana, but literally "hoofing it" could be the next best thing. 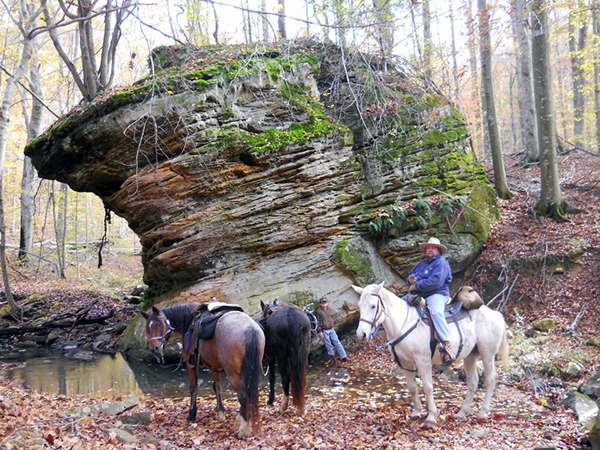 Just an hour east of Evansville in Cannelton, Froehlich's Outfitter and Guide Horse Rides offers a different kind of scenic route. Owner and guide Christie Froehlich always loved horses, and in 1994 when she saw a "For Sale" sign tacked on a small farm, she knew it was meant to be. Fast-forward 18 years, and Froehlich's is now a 40-acre farm hugging the Hoosier National Forest where Christie's 13 horses run free. When they're not saddled up for duty, that is. Open year-round, Froehlich's offers a variety of riding experiences depending on the skill of the rider. Rides and trails vary from a short-and-sweet hour and a half to a more strenuous five-hour trek. Whichever trail you choose, the scenery is guaranteed to be a treat. The three-hour option, the most popular for experienced riders, winds through the forest and stops at a creek with various rock formations. Christie's favorite is a huge, 30 foot spectacle called the Rock. "There are creeks and caves and great stuff you see out there and I always make sure to stop and point it all out. [The Rock] is a huge rock overhanging the creek...we always stop at the Rock." While the fall is the most beautiful time of year to see the forest, Christie says each season has its own perks. As long as you call ahead to make an appointment, you can take a ride just about anytime you want. Froehlich's horses are tame and hand-picked by Christie to make sure they're gentle trail companions and a good fit for riders. Both Christie and her husband accompany riders through the trails to ensure safety. If you don't have previous riding experience, don't worry. Froehlich's offers riding lessons for beginners before heading out, and Christie can often determine what trail ride is the best fit after a brief phone interview. Try to call at least a few weeks in advance so Froehlich's can determine how many horses to have ready, make an appointment for you and see if lessons will be necessary. What should you know before you saddle up? Do Bring water and a snack to hold you over. There's a surprising amount of endurance needed to go horseback riding, and you'll need the energy. Don't Show up in flip-flops or sandals. Wear sturdy, close-toed shoes and make sure you're also dressed appropriately in longer clothing like jeans and a long-sleeve shirt. Even if it's during the summer and hot, riding through the forest in a tank top and shorts can mean bug bites and scraping yourself on tree branches.